VICTORIA, BC – Swans Hotel & Brewery has announced that a popular and award-winning seasonal offering will be returning this week, a few months earlier than usual. A full boded dark ale with a rich flavour of chocolate, roasted grains and coconut. Brewed with caramel malt, roasted grains and organic coconut. 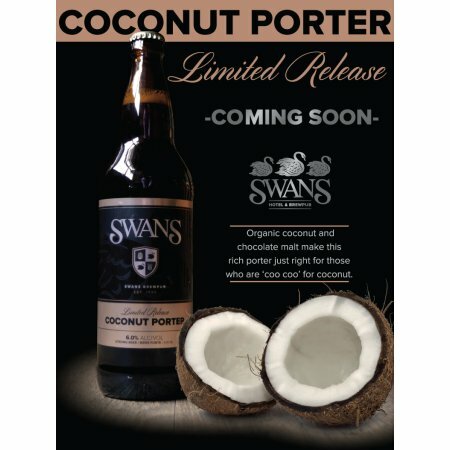 This latest edition of Swans Coconut Porter will be launched on Thursday September 4th at Swans with free samples from 5:30 to 6:30 PM. It will be available on tap at the Swans Brewpub, and in 650 ml bottles at the Swans Beer & Wine Shoppe and other select retail outlets in BC, while supplies last.